La Roche de Solutré is an impressive limestone promontory that peaks above the vineyard of Solutré-Pouilly. It indeed rises 493m above the Saône Plain and boasts prime views of the Mâconnais vineyard, Bresse, Dombes and Jura and even of the Mont-Blanc in clear weather! To the south are the village of Solutré-Pouilly and the Mont de Pouilly, to the west the old Roman road that traverses vineyards and groves, and finally to the north the Roche de Vergisson (another limestone spur). Archaeological artefacts uncovered at the foot of La Roche de Solutré show that Paleolithic men already recognized the site’s exceptional situation. The area produces also three renowned wine appellations. The chardonnay grape variety thrives in this terroir and produces the renowned Pouilly-Fuissé (we are here in the heart of this vineyard! ), but also Saint-Véran and Mâcon-Villages. The monks of the Abbey of Cluny planted these vineyards during the Middle-Ages. La Roche de Solutré was protected as of May 2, 1930 because of its archaeological and geological importance. It was classified Grand Site de France on May 26, 2013. The site is indeed the result of a rare geological phenomenon. Its formation goes back to the Mesozoic, when a warm sea covered the region. The surrounding soil is therefore mostly composed of deposits of fossilized marine animals. La Roche de Solutré, however, consists of fossilized coral reefs formed some 160 million years ago! The pressure of the emerging Alps mountain range transformed the region during the Tertiary era. As a result, the tender rock collapsed under the effect of erosion and formed the Plaine de la Saône. The hard rocks, such as La Roche de Solutré, resisted and ended up peaking above the plain. This geological anomaly contributed to the emergence and isolation of a unique fauna and flora. The best example are the so called Pelouses Calcicoles (an area of calcicolous plants) that grow at its summit. Calcicolous plants grow only on soils rich in calcium carbonate and can’t survive in acid soils. They are therefore unique to the site and led La Roche de Solutré to be integrated into the Natura 2000 network. Traces of human occupation dating back 55,000 years (Paleolithic) were uncovered at the foot of La Roche de Solutré at the place known as Cros du Charnier. The first excavations took place in 1866. They brought to light an astonishing quantity of bones of horses, auroch, bison and mammoths, but also countless tools and flint. They give us a fantastic insight in the life of these Paleolithic nomadic tribes. 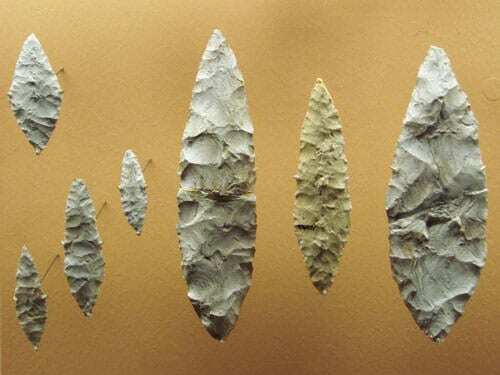 These archaeological deposits are the most important in Europe and the site has thus left its name - Solutrean - to this specific Paleolithic culture. The excavations were carried out until 1925 and brought to light nearly 70 human skeletons. However, it was later proved that these bones were much more recent than previously thought. They indeed came from a necropolis dating from the High Middle-Ages. This also shed light on the name of the site - Cros means rock and Charnier means charnel house. Excavations conducted in the nearby area also brought to light the foundations of two nearby Gallo-Roman villas. One of these domains, the domain of Solustriacus, has left its name to the village of Solutré. The archaeological museum founded by the General Council of Saône-et-Loire was inaugurated in 1987. This museum is sheltered under a dome planted with vegetation in order to blend into the protected environment.